The Phoenix Zoo was a popular site for visitors on the last Sunday in January. We waited briefly for a parking spot before exploring familiar pathways in the zoo. The crowd clustered in the popular new orangutan exhibit which made it difficult for me to wend my way next to a window for a closer view of these unique creatures. And, the windows were covered with handprints and otherwise marred for picture taking. 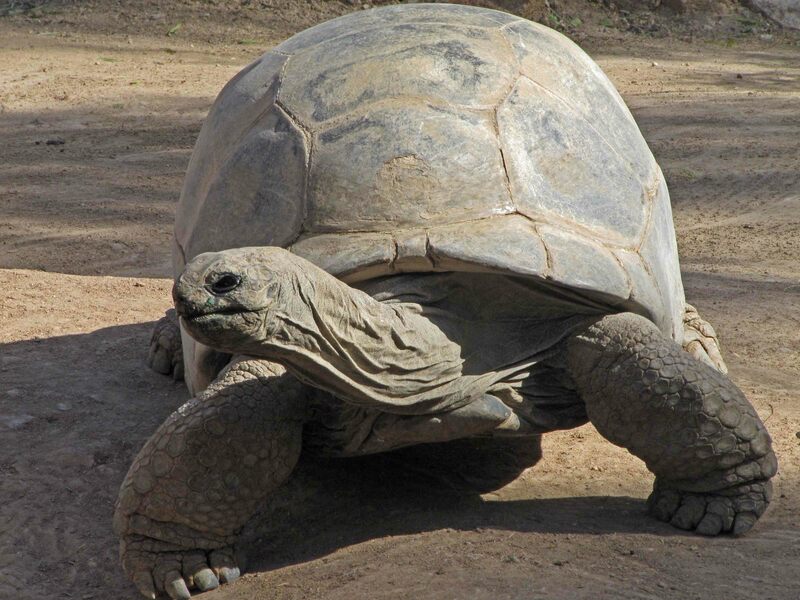 So we headed toward the pen for the Galapagos tortoises where we were surprised to hear the hoarse bellows and grunts of the male who was mounted on the female. After mating, the male approached us stretching his neck from side to side. In the neiboring pen the female Aldabra tortoise munched on grasses. Nearby, a rhinoceros iguana sunned himself on a stump. A male hamadryas baboon systematically checked for bugs on his mate while another curious baboon came to a window for a closer look at visitors. A colorful male mandrill meditated on the warm 70 degree temperatures. Finally, a fennac fox napped close to a window where we got a close look at his large ears. January is a pleasant time to visit the Phoenix Zoo.